As a result of these shifts, young Hispanics for the first time outnumbered young blacks on campus, even though black college enrollment has also grown steadily for decades and it, too, has surged in recent years. In 2010, 38% of all 18- to 24-year-old blacks were enrolled in college, up from 13% in 1967 and 32% in 2008. Despite the rapid growth in the number of young Hispanics enrolled in college, Hispanics are not the largest minority group on the nation’s four-year college campuses. Young black students continued to outnumber young Hispanic students by a dwindling margin at four-year colleges and universities. The Hispanic enrollment increase has been even more dramatic than the black enrollment increase because it has been spurred by a mixture of population growth and educational strides. High levels of immigration and high birth rates have made Hispanics the nation’s biggest minority group, comprising 16% of the U.S. population as of 2010. In 1972, just 5% of the nation’s 18- to 24-year-olds were Hispanic. By 2010, that share rose to 19%. However, population growth accounts for only a small share of the 24% Hispanic college enrollment spike from 2009 to 2010. During that same period, the total population of 18- to 24-year-old Hispanics grew by 7%. Rising educational attainment is the more dominant driver of these enrollment trends, over the long term as well as in recent years. The share of young Hispanics enrolled in college rose from 13% in 1972 to 27% in 2009 to 32% in 2010. Although the college enrollment rate of young Hispanics is at a record (32%), black (38%), Asian (62%) and white (43%) young adults continue to be more likely than young Hispanics to be enrolled in college. Hispanic educational attainment rose sharply from 2009 to 2010: The share of Hispanic 18- to 24-year-olds who have completed high school increased to 73% in 2010 from 70% in 2009, and the share of young Hispanic high school graduates who are attending college increased to 44% in 2010 from 39% in 2009. 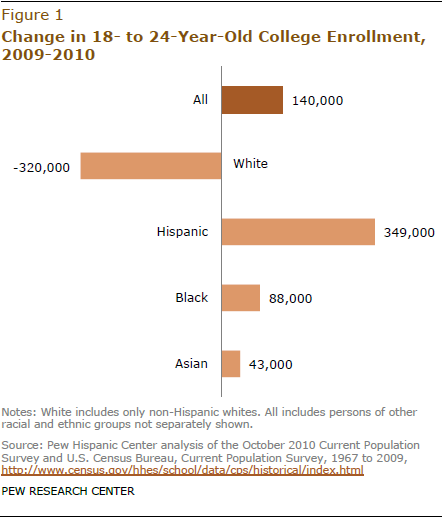 Much of this growth in college enrollment among young Hispanics has been at community colleges. Of all young Hispanics who were attending college last October, some 46% were at a two-year college and 54% were at a four-year college. By contrast, among young white college students, 73% were enrolled in a four-year college, as were 78% of young Asian college students and 63% of young black college students. The 320,000 student decline in young white enrollment since 2009 is a 4% decline and the largest decline in percentage terms since at least 1993 (when this historical series begins). The decline partly reflects that the size of the white 18- to 24-year-old population peaked in 2008. College enrollments have been rising steadily for decades, but the pace of growth accelerated when the Great Recession began in 2007. Historically high levels of unemployment, especially for young adults, appear to have served as a stimulant to college enrollment (Fry, 2009). The recession was officially over by mid-2009, but the economy has continued to struggle to generate new jobs and college enrollments have continued to set records. However, these macroeconomic conditions cannot fully explain why Hispanic enrollments grew so much more from 2009 to 2010 than did the enrollments of other racial and economic groups. For that, the demographic and educational attainment trends cited above would seem to be more determinative. Although Hispanic youths have narrowed the gap in college enrollment, Hispanic young adults continue to be the least educated major racial or ethnic group in terms of completion of a bachelor’s degree. In 2010, only 13% of Hispanic 25- to 29-year-olds had completed at least a bachelor’s degree (National Center for Education Statistics, 2011a). In comparison, more than half (53%) of non-Hispanic Asian young adults have at least a bachelor’s degree, and nearly 39% of white young adults completed a four-year degree. Among non-Hispanic black 25- to 29-year-olds, 19% have at least a bachelor’s degree. The low college completion of Hispanic young adults partly reflects the lower schooling levels of Hispanic immigrants. Among native-born Hispanic 25- to 29-year-olds, 20% had completed a bachelor’s degree. In analyzing trends in college enrollments by race and ethnicity, this report focuses on the enrollments of 18- to 24-year-olds, the traditional age of college students. However, many older adults also attend college. In 2010, 18- to 24-years-olds accounted for 60% of the entire college population in the U.S. and 71% of the full-time college population. 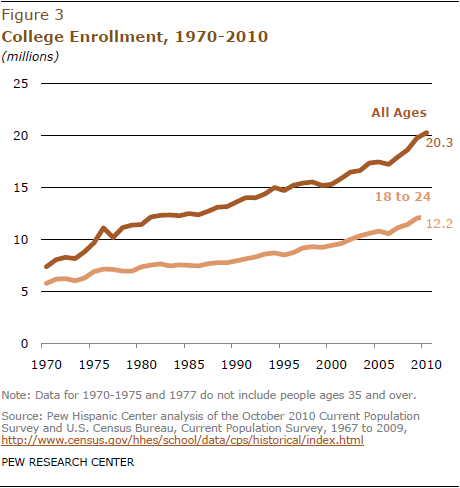 As shown in Figure 3, the long-term trends for enrollments of college students of all ages and ages 18 to 24 have followed a similar trajectory. Both groups set records for enrollments in 2010.